Just because you’re travelling with the kids in tow doesn’t mean your next family holiday needs to break the bank. Townsville North Queensland is jam packed with activities, and the best part is that most of them cost less than your weekly coffee bill! So start packing and add these family friendly (and affordable) activities to your holiday itinerary. Feed a kangaroo, cuddle a koala or race a turtle. 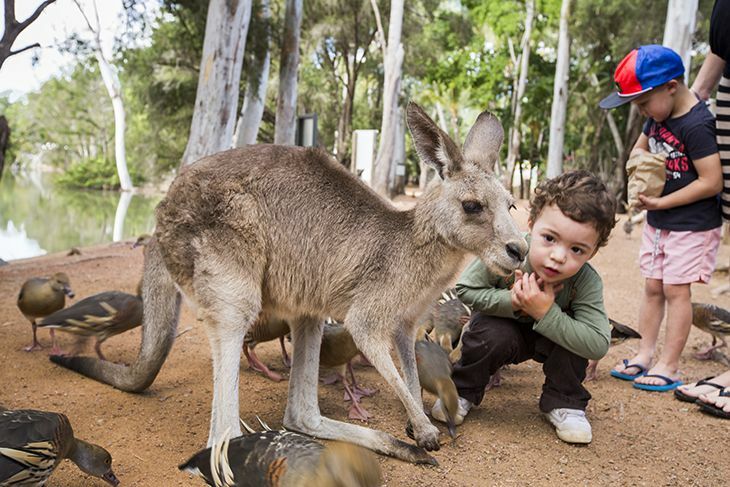 With more than 50 native animal species calling Billabong Sanctuary home, this family owned park offers hours of fun and entertainment for children (and parents) of all ages. Plan your day to ensure you catch one of the park’s regular animal shows – the kids will be amused and they’ll learn something new too! Summer just got a whole lot cooler with a family road trip to Paluma! This village in the mountains is the ultimate summer swimming spot. The temperature will gradually drop as you make your way up the windy road through the lush rainforest. Take a hike along a rainforest trail, cool off with a swim in the clear waters of Crystal Creek, admire the handiwork of the historic stone bridge, stroll through the Paluma village or enjoy a picnic by the running river. Before you make the road trip home, allow time for a visit to Frosty Mango at the base of Paluma. Treat yourself to a delicious ice-cream and get the family together for the compulsory photo by the big mango-man statue. This is one stopover the family will thank you for! No Townsville visit is complete without a trip to Townsville’s famous beach promenade – The Strand. From water parks to swimming lagoons and cafés galore, The Strand is a great place to let the youngsters go wild! Do your kids turn their noses up at every mention of the word ‘exercise’? Never fear, we’ve got the perfect outdoor activity that will burn off the excess holiday calories without them even noticing the extra steps! Magnetic Island’s famed Forts Walk is a four kilometre hike (two hours return) featuring various WWII fortifications overlooking some of the Island’s best views across the Coral Sea. The Forts Walk is also home to a large koala colony! Get the kids to keep a lookout along the way to see how many they can spot, it’s a game of hide and seek at its best! If you take your car across on the Fantasea Barge, make sure you explore some of the Island’s most secluded and spectacular beaches. Check out Radical Bay for a beach that features a piano – yep, the kids can bust out a tune while you sit back and relax. Now there’s a unique family photo! Snorkeling, fishing, feeding birds of prey and so much more, if you want to experience the best of Magnetic Island, you can’t go past a tour with Aquascene Charters. Experience a lifetime of local knowledge and secret spots from tour guide, Adam Hinks, who has called Magnetic Island home for more than 30 years. The best part is that Adam and his wife Steph have four kids, so keeping the whole family entertained comes naturally to them. If your children can recite the entire script from Finding Nemo, then take them to Reef HQ Great Barrier Reef Aquarium. While the kids will be amazed by the fish, sharks and turtles, you’ll be impressed by how much they learn at this fantastic attraction. Experience the Turtle Hospital tour, a great way for the kids to see firsthand how they can help protect the Reef and the marine life that call it home. From navigating the high seas to discovering the stories behind Indigenous artefacts, the Museum of Tropical Queensland features a number of fascinating exhibitions and collections that explore life in the tropics from prehistoric times to the modern era. The kids will love the hands-on displays – it might be hard to drag them away!